The 6-week run opens at The Fillmore in Washington, DC on September 22 and wraps at the Monster Mash festival in Phoenix, AZ on November 1. Tickets for all shows will go on sale Friday, June 12 at 10 am local time. Tickets for select dates will include digital redemption codes of “Meliora” before the official release. Due August 21, “Meliora” follows the band’s second album and major label debut, 2013’s “Infestissumam”, which debuted at number one in Sweden and won the Swedish Grammis Award for Best Hard Rock/Metal Album. Produced by Klas Åhlund and mixed by Andy Wallace (Slayer, Nirvana, Guns N’ Roses, Linkin Park), the project sees the debut of new vocalist Papa Emeritus III alongside the Nameless Ghouls following the resignation of his three-month older brother Papa Emeritus II. This week, Ghost premiered the video for “Cirice”, the lead single from the record. 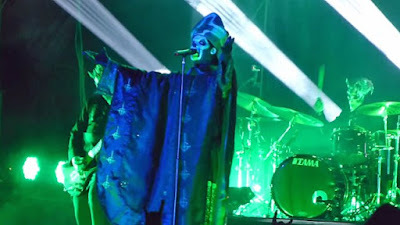 Papa Emeritus III made his live debut with the band at Doom in Linköping, Sweden on June 3, where the group premiered four songs from the upcoming album.